The Men's Room Gifts for Father’s Day! Face	No Comments on Gifts for Father’s Day! Today at noon PST, I will be on an NBC 7 (San Diego) news segment suggesting a few gift ideas for Father’s Day, which by the way is this Sunday! If you happen to miss it, no worries, here are the items that made the show (below). And if you’re still undecided, don’t forget that there are many more ideas here in my Product Reviews and Product of the Month sections. Happy shopping, and don’t forget to tell your Dad “thank you”, he’ll like that. Trust me! Z Zegna – woodsy, aromatic with sparkling head notes of white pepper, bergamot, casoar fruit and rosemary. At its heart are seductive notes of iris and nutmeg that lead into a sensual base of cashmere wood and patchouli. Aramis Classic – Launched in 1964, this contemporary classic is characterized by a warm, woodsy-mossy background vitalized with citrus, herbs and exotic spices. Midnotes of sandalwood and spices. 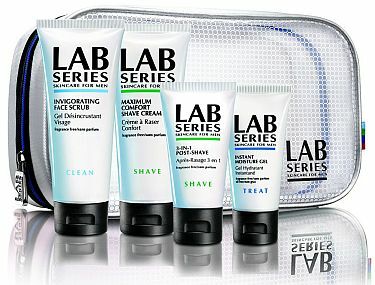 Lab Series Skincare for Men “Deluxe” Shave Set – just enough items to get a close and comfortable shave and great looking skin.